Metal fabrication manufacturing is the process where metal sheet is cut and molded into a new form to meet the desired requirement. 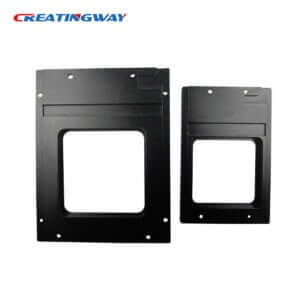 Metal components such as sheet materials and metal bars are mostly used in many industry like automotive, home application, electronic device, IT services, Lighting etc industry, welcome visit our Creatingway’s industry served for more information. • Design: This means primary analysis of the requirements, and planning to create actual products that match the client specifications. • Build: This is the step that comes after design and planning. The manufacturer can employ the wide range of metal fabrication techniques to develop the desired product. • Secondary Fabrication: This include assembly is done to improve the quality of the product after the fabrication. This meanings we have to after process for your product from polishing, coating, silk-screen to welding and assemble etc. What kind of process metal fabrication manufacturing included? Metal fabrication manufacturing has below main steps from easy bending, punching to mold. Stamping: This method is performed when stretching and shaping metal sheets into a 3D object. Some of the popular examples include gears, pots or cans.They are very useful in today’s world. Bending, In this step, bending of a metal sheet into a desired angle is achieved.Bending changes the shape of metal but not its volume. This can be performed using a press brake machine. Drawing: In this step, strong tensile forces are employed to convert molten metal is into a die. Milling: Here,non-circular holes in a metal sheet are cut by use of a milling machine.This enhance reduction of weight of the metal sheet a d improving the appearances..
Punching: This method enhances creating of the patterns on metal sheets using uniquely shaped turrets. Drilling: This method enables drilling of circular holes in the metal sheet. Casting: This method is where a hot liquid metal is introduced into a mold, and then allowed to cool, and harden. Turning: This includes rotating for shaping by cutting tool mt. What kind of materials will be used for metal fabrication manufacturing? A choice of the right fabrication method mostly depends on the client specifications, metal involved, part geometry, and intended purpose of the product. The following material can be used for metal fabrication, included stainless steel, aluminum, brass copper bronze, galvanized sheet etc. Welcome visit our material sheet guide for more information. Advantages of metal fabrication manufacturing. Metal fabrication depends largely on the grade of metal used during production. • Heat resistance: Metals have a higher melting-point.this is very important to give wide range of temperature. • Improved strength: Metal grades are stronger, harder, and durable. • Cost-effectiveness,the go with lower price that many can afford. Disadvantages of metal fabrication manufacturing. In conclusion,metals fabrication has the best results compared with other material fabrication like plastics.